It’s difficult to go to Venice without experiencing a gondola ride isn’t it? I have actually been on one before but not with our three children (and with good reason). And so began the search up and down steps, and in and out of the rabbit warren of streets that makes this floating city unique. Finally we spy a very glossy black and gold number that frankly looked too good for the likes of us (and worth 35 000 Euros) but the gondolier was spruiking his goods nearby and happily his price was good, so off we sailed, or perhaps rowed with Rudi. 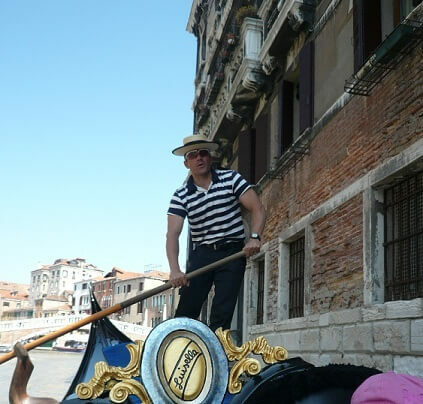 After ensuring that everyone was strapped down, I mean in, I couldn’t help but notice that Rudi was not like the other gondoliers I had seen around Venice. Rudi had rippling muscles. He also reminded me of a machine gun, speaking in fast, rapid bursts without seeming to breathe and after a mini-interrogation I discovered that this man had been rowing gondoliers since the age of four and was in fact an elite athlete. Naturally my curiosity was piqued and with further probing he explained that he trained for 90 minutes each day outside of his daily rowing and no, he didn’t eat anything out of the ordinary and just ate three meals each day. I knew Rudi wasn’t telling me the whole story as language was no small barrier so as soon as I was able I did the Google. The Vignottini. To me this name has the ring of mafia about it and why not as we are in the perfect place for it. But no, my new friend Rudi is one half of a fearsome duo with his cousin Igor that has been competing in gondola racing around the canals of Venice for the last 20 years. They are feared and revered and are firmly sewn into the fabric of the history surrounding professional gondolier racing. The most important Venetian race of the season is the Regatta Storica, through the Grand Canal and winning this event has been likened to winning the Ironman Triathlon or the Tour de France or both. Not sure whether this is possible but the Italians are very dramatic. To win this regatta five years in a row is almost an impossible feat and a couple of years ago, the two arch rivals, The Vignottini and another famous rowing duo, Ivo Redolfi-Tezzat and Giampaulo D’Este were both competing for this honour. In a major upset The Vignottini triumphed and wrote themselves into the history books. Yep, that was our gondolier. In his book, The Outliers, Malcolm Gladwell suggests that ten thousand hours of practice is required to achieve the level of mastery associated with being a world class expert – in anything. Sure, there needs to be talent and opportunity but this aside, the 10 000 hours still stands. Talent and genetics are clearly there for Rudi, rowing a gondola since the age of 4, living on the canals and rowing for a living all provide opportunity and way more than 10 000 hours, paving the way to becoming a world class expert and performer. What are you doing your 10 000 hours in? Back to food. I often advise people to do a large food shopping trip to assist in time management, less impulse buying and organisation and I do the same thing when at home. Italy however is making me think. I love the fact that there are little fresh produce stores on every corner which allows me to buy whatever we feel like on the day and there is so much less wastage. How do you do your shopping? Strange things sometimes turn up in menu’s and our lunch in Verona, home of Romeo and Juliet was no exception. There were many choices to make but two in particular caught my eye. ‘Flayed cavallo’ (horse) and Equina Pizza, with horse once again being the main ingredient. I think ‘flayed’ was meant to be ‘fryed” but maybe not, it could go both ways. Yes, I know that it’s just another source of meat and one that is quite popular here in Italy but I can’t get past Mr Ed.